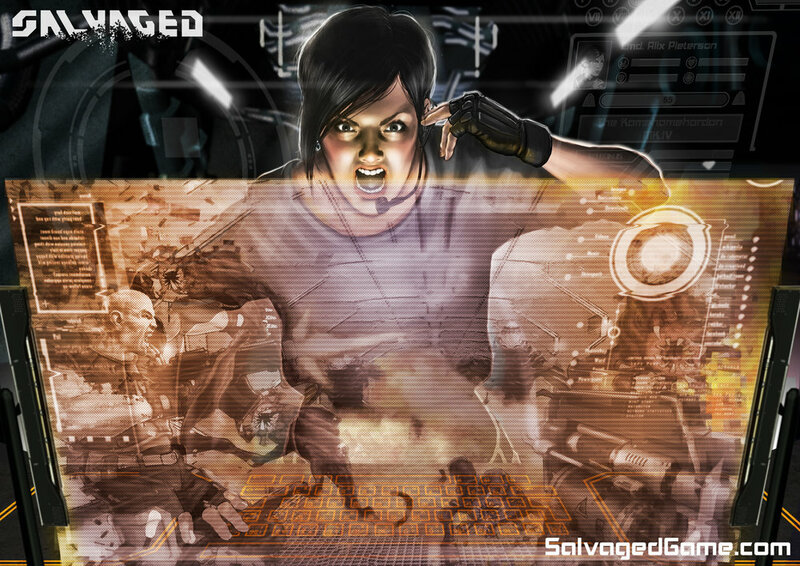 Salvaged is a multi-platform tactical action game set in a dark sci-fi reality where aliens roam abandoned spaceships and DNA is a commodity. Your only company as ship commander Alex Pieterson is the melancholic and sometimes eccentric ship AI, Thaddeus. The command room is a solitary place for Alex Pieterson. Lab Grown Music reflected this in the music soundtrack by using minor keys, haunting reverbs and solo string instruments. Check out this preview of some of the tracks. The music during your agents' missions are a different story. Although it retains some of the harsh and dissonant sounds of the Command Room music, it is much heavier and more brutal, containing coarse basslines punctuated by driven drum beats and distorted synth stabs. Salvaged contains a large array of weapon types such as melee, shotguns, automatics, fire, electrical, plasma and grenades. Each weapon required bespoke sound effect design consisting of shots, their moving projectiles and impacts. There are 6 species of alien enemy that your crew may encounter on other ships, each with their own character. Lab Grown Music created sound effects for each to help bring them to life, including vocal roars, moans and exhalations, footsteps and body hits. The game unfolds in first person from Alex Pieterson's perspective. She calls all the shots from her seat in the command room so it is important that her environment feels immersive. The ships ambience includes lots of individual sound sources - the distant engine hum and creaking metals of the spaceship, failing machines in the command room and holograms. There are also warp speed and shuttle docking cinematic sequences that required engine and docking bay sound design to bring them to life. Your only company throughout Salvaged is the ship A.I. Thaddeus. The storyline is key to the experience and is told through Thaddeus' eccentric musings. The dialogue had to go through lots of post-processing before it sounded like a believable ship A.I. and had to remain clear and emotive whilst containing no extraneous mouth sounds normally inherent in human speech. Trading salvage and making upgrades are also key aspects of the game, so it was important to create satisfying U.I. sound design that rewards the player. The rusting computer hardware also has its quirky sound effects that make interactions with the console more rewarding. These are Alex Pieterson's personal logs, and key to the unfolding narrative. To enhance the amazing voice acting, Lab Grown Music created a mixture of sound design and music content. The musical passages give the entries greater emotional depth, and the sound design helps to plant the overall experience firmly on the drifting Thaddeus spaceship.